How to Get a Counselor that Understands the Issue? - CREATIVE CONFLICTS! You are here: Home / communications / How to Get a Counselor that Understands the Issue? How to Get a Counselor that Understands the Issue? Relationship Counseling And Passive Aggressive Behavior: Is your counselor an expert in passive aggression? 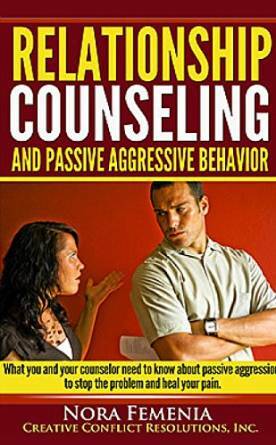 This book helps the wife recognize the impact of passive aggressive behaviors on her marriage, so she can get a counselor to help restore her sanity. Only after realizing that she is indeed in this sad situation, she can be motivated enough to search for external help to heal this toxic marriage. Of course, the husband will show strong resistance to share the visit to a relationship therapist or to a counselor. Usually they express that they are satisfied with the way things are, and deny the harmful impact of their behavior. If the husband doesn’t want to take up the responsibility for his own behavior, it doesn’t mean that she is condemned to suffer alone forever. This book helps her to identify distress areas, so she is better qualified to explain her needs to the therapist or counselor. The only solution for this dilemma is for her to get an individual counselor that understand this particular style of marital interaction, knows the progressive hurt happening on her personality and can prevent or repair the damage while supporting the wife to recover her identity. Relationship Counseling And Passive Aggressive Behavior will shorten the time in the councilor’s office, because the client will know exactly what her pain points are, inviting her counselor to provide solutions to urgent issues. Once they are addressed, she will be empowered enough to manage or transform her passive aggressive marriage.